Three done, about_____ more to go!! I am referring to the number of cheongsams I have in my humble collection. Seeing as how I am 93, the cheongsams just kept creeping into my closets over the years – without much fanfare! Would anyone care to guess how many more are yet to be included in my Cheongsam Challenge? Some are more suited for day and others for evening. 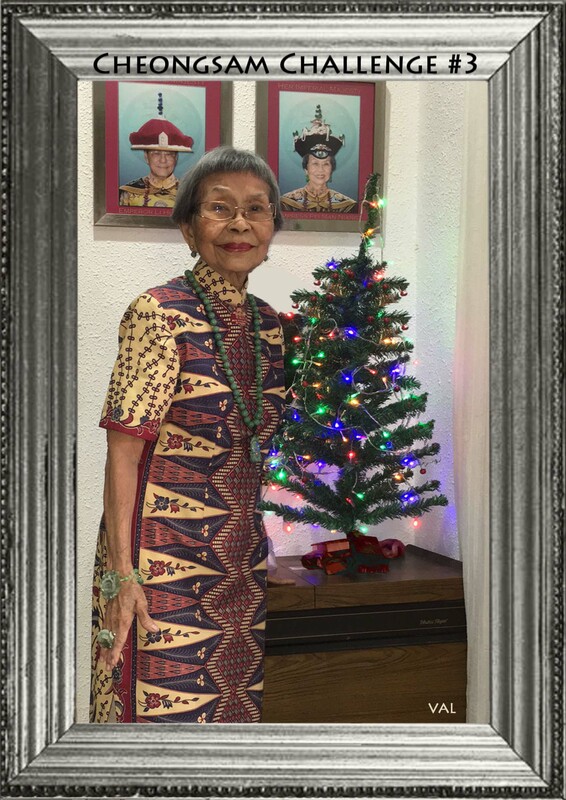 Today being Day 3 of Suzanne’s Cheongsam Challenge, I chose to wear a batik piece, with a bold and dramatic zig-zag pattern in maroon and navy blue that runs down the front, while the more subdued tiny leafy pattern adorns the back and sleeves. There is no opening that runs across the front shoulder so as not to vie for attention with the fabric pattern. I have paired it with black sandals though you do not see it in the photograph. The green accessories add a touch of contrast to the whole outfit. The Christmas tree is a miniature reminder that it is ‘Christmas everyday’ hence it is up all year round! Have a wonderful start to the week and God bless.